CHENNAI, India (Thomson Reuters Foundation) — Urban India is employing an increasing number of children — many under nine years of age — in producing everything from pickles to fireworks, working in tourism and labouring on building sites, a U.N. children's agency report and campaigners said. The State of Child Workers in India report by UNICEF, based on the latest Indian census data, says the proportion of child workers in the five-to-nine year age group jumped to 24.8 per cent in 2011 from 14.6 per cent in 2001. The same decade also saw an increase in urban child labourers to 2.9 from 2.1 per cent of the child population. 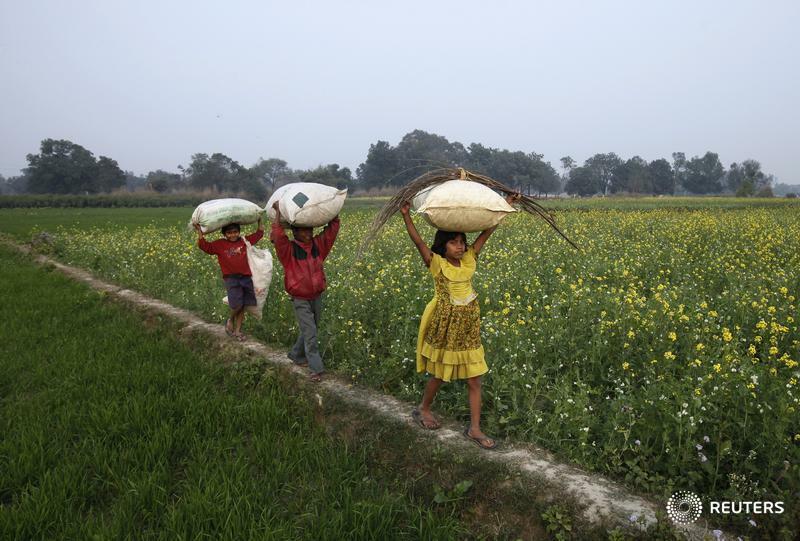 While across India there was a drop in child workers, to 3.9 per cent in 2011 from five per cent in 2001, campaigners say the problem could be much bigger, with data failing to capture the extent of child labour in the home. Andrew Sesuraj of non-profit Tamil Nadu Child Rights Observatory said most of the information available only takes into account those children working in the organised sector. "Girls doing domestic work, children in agriculture, those working with their parents are totally discounted... What we see is just the tip of the iceberg," said Sesuraj. Helen R. Sekar, co-author of the report which was published this month, said that most child workers are migrants with no home address and who do not figure on any government list. "Investigators would not come across these children when they visit homes for data collection," said Sekar. Falling agricultural returns, landlessness and few work opportunities are also forcing rural families into cities, putting their children at greater risk, say campaigners. The analysis shows that although education policies have led to a rise in literate children, inadequate family earnings still compel them to work and supplement household incomes. Komal Ganotra of non-profit Child Rights and You said there is an increase in work being outsourced to Indian homes and wages being paid per piece produced. "It is motivating parents to employ their children to earn more. The number of children working with their families and dropping out of school is increasing," said Ganotra. The report cites the embroidery, shoe, carpet, garment, leather and lock-making industries as examples where "invisible children" work with their parents to increase household income. Produced in collaboration with the V.V. Giri National Institute of Labour, the report identifies 32 child labour hotspots, with the cities of Hyderabad and Jalore topping the list with 67,366 and 50,440 child workers respectively. The report says that while the growth of child workers is decreasing at two per cent annually, at that rate it will take almost 200 years for India to completely eradicate child labour. It calls for better implementation of education policies, including better schooling for migrant children to reduce cases of child labour. "We are looking at the report and will come up with suggestions accordingly," said Stuti Kacker, head of the National Commission for Protection of Child Rights.